The main symptoms of adhesive capsulitis are stiffness, pain and decreased range of motion in your shoulder and upper arm. You will often be unable to lift your arm over your head or away from your body nor will you be able to rotate it inwards; eventually you may not be able to move it at all. The lack of movement in your shoulder joint will interfere with your everyday tasks like getting dressed, driving, working; even completing simple things like reaching behind your back to scratch it. Muscle spasms in your rotator cuff muscles and swelling of your tendons will also limit your ability to move. Pain is generally experienced over the front and sides of your shoulder and upper arm area (around your deltoid, biceps brachii and rotator cuff muscles) which can radiate down to your elbow and wrist, or around your upper back from your trapezius muscle, because of the restricted joint space. You will experience pain with movement (such as trying to reach across your body) and eventually at rest. However depending on the cause of your adhesive capsulitis, it can be referred from other areas like your neck, heart, diaphragm, liver or spleen. Weakness in your shoulder, upper arm and back muscles will occur over time from lack of use; this can create an imbalance in your muscle strength (as the stronger muscles have to compensate for the weaker ones) and cause muscular strains and alignment issues. Many people will experience depression, anxiety and psychological stress because of the secondary effects of the constant pain from adhesive capsulitis over the long term (stop working which leads to financial stress, stop participating in social and sports activities). Some people have even experienced an increase in body odor as they find it harder to reach and clean their armpit areas. Often there can be changes in your local nerves to your sweat glands. You will experience a slow onset of mild pain in a generalized area of your shoulder that increases with movement and eventually at rest. Inflammation and tenderness around your joint as a result of muscle spasms and scar tissue that binds your shoulder tissues tighter creates stiffness, which will decrease your range of motion. A vicious circle then develops - the lack of shoulder movement (from trying to protect your shoulder and decrease pain) increases scar tissue development, which decreases the space in your capsule and limits your movement, creating even more stiffness. Pain is often worse at night when sleeping and/or lying on your sore side. This phase of adhesive capsulitis can last between 1- 9 months. In the last phase, your shoulder pain decreases drastically, and your scar tissue begins to loosen. As a result your stiffness goes away slowly and your full range of shoulder movement returns gradually. External rotation (turning outward) of the upper arm improves first, followed by abduction (moving up and away from the body) and internal rotation (turning inward). This phase of adhesive capsulitis can last between 5 - 36 months. Surgery may be required if you experience no improvement within 12 - 18 months of following a treatment plan from your doctor. Should You Seek Medical Attention? A Shoulder T•Shellz Wrap® is one of the most helpful tools for a shoulder injury. With DTR Therapy (via use of a Shoulder T•Shellz Wrap®), soft tissues are safely and gently heated - increasing blood flow within the treated area. Your body's natural response to this increased temperature is to try to maintain a condition of homeostasis - a balanced environment or state of equilibrium throughout the body. To do this, your body responds with a rapid increase in blood flow to the area (this is known as vasodilation), increasing the supply of nutrients to injured cells and flushing out toxins (including lactic acid, commonly found in trigger points) to promote healing. Our T•Shellz Wraps provide effective, non-invasive, non-addictive pain relief with no side effects. 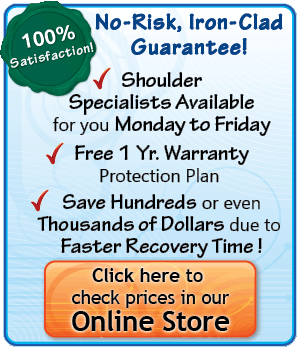 If you are suffering through a shoulder injury, we strongly believe that we can help you, and we have thousands of happy clients to back this claim. You are welcome to try our products for a 60 day period.. If you are committed to following the treatments outlined in the product instructions we are very confident that our TShellz Wraps will aid you immensely. If you do not receive the benefits that countless of our other customers have experienced from our products, call us, mail the product back to us and we will provide you with a full product refund.